Tom Brady is now 40 years old and one thing is clear – he is going to obliterate NFL records for quarterbacks in their 40s. To just be a starting quarterback in the NFL is rare. For Brady to still be at the top of his game as he enters his 40s is almost unheard of. This season, Brady is a leading candidate to be named NFL MVP as he leads the NFL in yards, completions, yards per attempt, and he has thrown 30 touchdowns with just 8 interceptions. 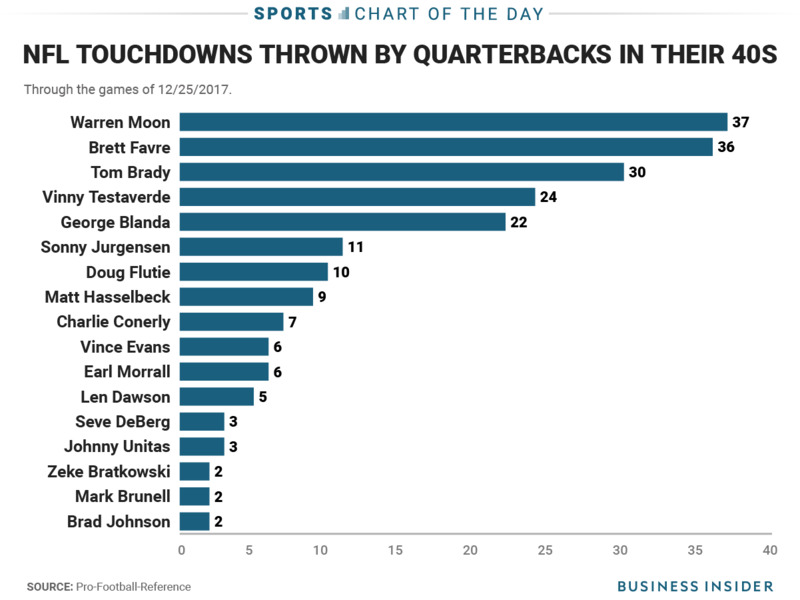 In the history of the NFL, Brady is just the 17th quarterback to have thrown a touchdown pass after turning 40, and one of those players – George Blanda – was primarily a kicker in his 40s. With his 30 touchdown passes, he now trails only Warren Moon and Brett Favre for most TDs in his 40s and should easily pass both early next season.